I’m always trying to find new ways to connect with my students and encourage them in and out of the classroom. At the beginning of this year I decided to make a class instagram. At first I was a little unsure of the idea, but I knew that Instagram was this generations most used social media. Although they were a little mad that I wouldn’t follow them back my students loved that I had an instagram just for them! I use my Instagram to post pictures of students working together in class, fun activities, motivational memes, and their class and homework! I also let my students direct message me pictures of their homework if they have questions. This way I am able to see their work, and I get a notification on my phone right when they send it. Today I decided to use Instagram another way. I want my students to be exposed to more than just the curriculum, so I decided to start #mathcrushmonday. When students walk in the door on Mondays my Instagram is up ready on the SmartBoard with a mathematician as my latest photo. 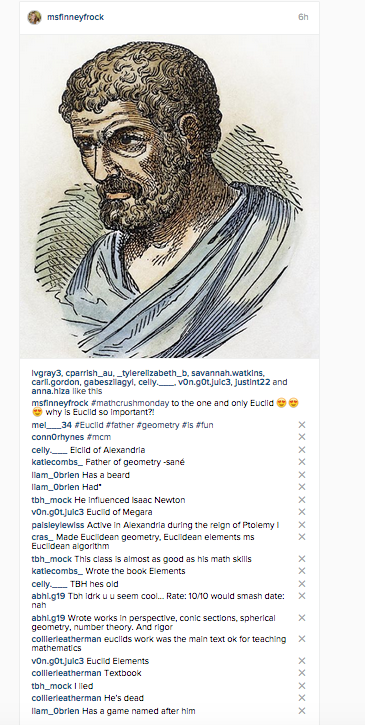 Today my students saw Euclid on the board. 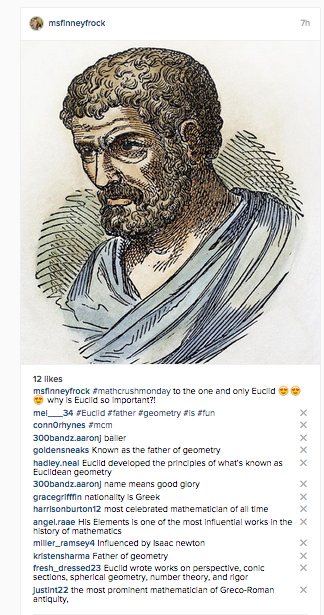 For the first few minutes of class students looked up facts about Euclid and posted them in the comment section of the picture. I was constantly refreshing my Instagram page so the whole class could see as facts came through. I think that this activity went really well. It’s a great relaxed way to start class on Monday, and students got to explore mathematicians they may have never heard of before. 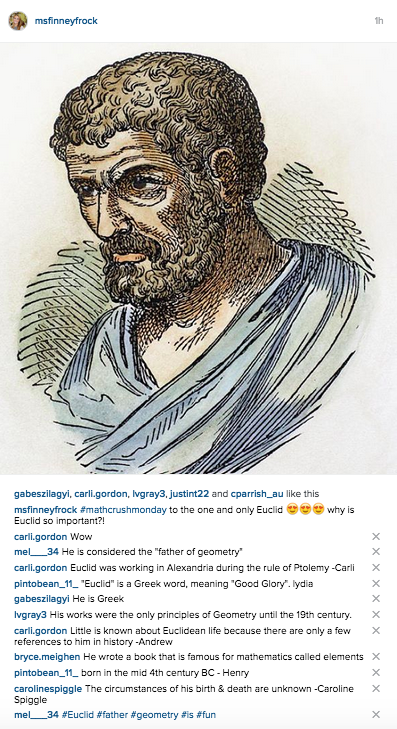 Today I chose Euclid because I teach three-sections of Geometry. I thought that it was important for my students to know where geometry came from. Between each of my sections I deleted the facts from the class before so every section had the same experience.